He was a talented athlete. Standing 6 foot 1 inch and weighing about 200 pounds, Bithorn commanded attention when he took the mound, began his distinctive windup, raised his long left leg high in the air and followed through with a powerful right-hand pitch over home plate, striking out one batter after another. He had remarkable control and delivery of a straight-line 90- to 95-mile-per-hour fastball that at least one time resulted in a hand injury that required a change of catchers.2 But, it would take more than technical skill and brawn for this Latino baseball player to make it to the big leagues in the 1940s. Historically, Latinos had been playing in the major leagues since the early 1900s,3 and while earlier Puerto Rican players may have had the right stuff for the big leagues, until Bithorn came along, the color of their skin was deemed too dark for the all-white clubs of that time. 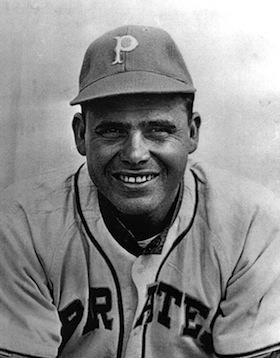 Born March 18, 1916, in an area of San Juan called Santurce, Bithorn came from a family of Danish-German-Scottish and Spanish descent.4 He had light olive skin, spoke English, and his name did not sound Latino. Besides, he had a mean pitch. Hiram’s father, Waldemar G. Bithorn, was a municipal employee while his mother, Maria Sosa, was a public school teacher. Hiram, the fourth of five Bithorn children, had three brothers, Waldemar, Fernando, and Rafael, and a younger sister, Maria Angelica. Most games in San Juan were played in Sixto Escobar in El Escambron, where local fans filled the benches and even climbed into the trees outside the ballpark to secure a good vantage point to watch Bithorn at work.10 It was just a matter of time before he’d get a chance to play in the United States, and eventually in the major leagues. The opportunity came in 1936 when two individuals saw something special in him. That is how it happened that on March 1, 1936, 20-year-old Bithorn pitched his first game against a major-league club. For seven innings, he allowed Cincinnati only one run, but when the Reds scored three runs in the eighth inning, the Eagles brought in a relief pitcher to save the game.13 The Eagles took the game, and Bithorn would get the break he needed to play in the United States. Frank Duncan, catcher for the Eagles in that series, is credited with helping the Puerto Rican polish his pitching technique, while outfielder Ted Norbert recommended him for a contract with the Class B Norfolk Tars of the Piedmont League.14 Bithorn would spend six seasons in the minor leagues, moving up midseason 1937 to the New York Yankees’ Class A Binghamton Triplets. Midseason 1938 he continued to improve, advancing to the Newark Class AA team, also affiliated with the Yankees. In his first two seasons in the minor leagues, he pitched 16-9 and 17-9 respectively. Hiram moved to the Pacific Coast League in 1939 where he acquired the nickname "Tropical Hurricane" or just "Hurricane" Bithorn. He played three seasons in the Class AA clubs Oakland Oaks and Hollywood Stars, achieving win-loss percentages of .481 (1939), .370 (1940), and .531 (1941). He closed the 1941 season with a 17-15 record. Two of those games were shutouts. Baseball players and movie stars appeared together in print advertisements as well as social and promotional events. Fraternizing among baseball players and movie stars was all part of the Hollywood environment in which the Puerto Rican found himself. According to family members, Hiram did well socially in Hollywood, and in particular, befriended actress Ida Lupino. Although there is no evidence to support the story that the two were romantically involved, it is at least interesting to note that the Bithorn name appears in her 1943 movie, The Hard Way. In one of two shots of a newspaper page, the name of the character Laura Britton reads Laura Bithorn, doubtless a nod to Lupino’s baseball-player friend.19 By the time the movie came out, the Hurricane was already playing in the major leagues. At the end of the 1941 season, the Chicago Cubs drafted Bithorn from the Hollywood Stars, along with Cuban-born Salvador “Chico” Hernández, from the Texas League’s Tulsa Oilers, thus forming the third Spanish-speaking pitcher-catcher battery in major-league history.20 Not only did Bithorn and Hernández speak the same language, photographs reveal a striking similarity of physical features. Former Cubs shortstop Lennie Merullo described the two as very popular “big handsome guys.”21 They were born within three months of each other (Hernández on January 3, 1916, in Cuba, and Bithorn on March 18, 1916, in Puerto Rico). The pitcher stood only one inch taller and weighed only five pounds more than the catcher. Bithorn made his major-league debut with the Cubs on April 15, 1942, at Sportsman’s Park in St. Louis. Hernández made his the following day, April 16, 1942, also in St. Louis. Bithorn pitched two innings and allowed no hits in his debut game, which the Cubs lost, 4-2. Noteworthy are Bithorn’s 1943 wins against the reigning world champion St. Louis Cardinals. Even though the Cardinals would go on to win the pennant, Bithorn allowed them only two runs in 32 innings. Despite his success as a major-league baseball player, Bithorn lived under a cloud of rumors and gossip regarding his racial ancestry. Simply the fact that he was Latino was enough to raise doubts in some minds and fuel suspicion that he might be a mulatto. Ever since the early 1900s, when the first Latinos were recruited to play organized baseball in the United States those responsible for policing baseball’s color line during the Jim Crow era had sought evidence of a player’s “whiteness” or Castilian blood line as a qualification for admission to a major-league team.29 The Cubs were satisfied that Bithorn was white, and in fact, published his biographical information stating he was of Danish and Spanish heritage.30 Nonetheless, Bithorn endured ethnic stereotyping and harassment from opposing players, fans, and managers, including New York Giants manager Leo Durocher, who discovered the limit of taunting the pitcher would take. After his discharge on September 1, 1945, he reported to Chicago Cubs for the final weeks of the season, but did not play.36 Four months later, on January 3, 1946, Bithorn and Chicago native Virginia Arford were married in Mexico. The next month he injured his hand while playing in the Puerto Rican championship games, delaying his return to the Chicago Cubs for the 1946 season.37 He appeared on the mound in only 26 games in 1946 to garner six wins and five losses, primarily as a reliever. Clearly, Bithorn was no longer the promising player who had pitched over 249 innings and seven shutouts in 1943. He’d gained about 25 pounds, and according to some, emerged from the military a changed man, grumpy, argumentative, and no longer the baseball star he had been before his military stint.38 While some have speculated as to what may have happened, the real cause of his changed personality and lost skills remains something of a mystery (though arguably a nagging arm problem must have been a contributing factor). Reports that he suffered a “nervous breakdown” while in the Navy are flatly denied by family members today.39 With his baseball career clearly on a downslide, the Cubs traded him to the Pittsburgh Pirates, but he never played for them. He was then selected off waivers by the White Sox, but plagued by that sore arm, he played only two games with the club. His major-league career ended with his final game, the first of a doubleheader against the Philadelphia Athletics on May 4, 1947, at Comiskey Park. Bithorn pitched only one inning and allowed one hit, but got the 8-7 win over Philadelphia. Playing in 105 games during four seasons (1942, 1943, 1946, 1947), he accumulated a major-league win-loss record of 34-31 and a 3.16 ERA. He pitched 509 2/3 innings and allowed 517 hits while playing in the big leagues. Hiram and Virginia lived in Chicago when their only child, Hiram Jr., was born in May 1951. In the meantime, Bithorn’s mother, along with his sister and family had moved to Mexico City where Maria Angelica attended university. Plans were made for Hiram to sponsor the baptism of her one-year-old son, David Hiram Arechiga, during the year-end holidays. However, fearing the trip would be too difficult for her and the baby, Virginia and seven-month-old Hiram Jr. remained in Chicago while Bithorn headed out on the 1,685-mile journey alone. Driving a 1947 Buick, he crossed the U.S.-Mexico border and traveled to the extreme southern part of the state of Tamaulipas to the town of El Mante along Federal Highway 85. Here he met his untimely death by a policeman’s bullet to his stomach. Exactly what happened that night remains a mystery, but apparently he stopped in El Mante to get a hotel room. While some reports say he had no money to pay for the room, another says he had $2,000 in U.S. currency with him.41 The policeman, Corporal Ambrosio Castillo Cano, claimed Bithorn attempted to sell his car to raise money for the hotel room, but had no license or registration papers for it. How he could have made it all the way from Chicago to Mexico without a license, registration, or money remains another puzzling piece of the Bithorn mystery. Outraged over the death and crude burial of the baseball player in Mexico, Puerto Rican officials and Bithorn’s family demanded that his remains be returned to the island for a proper Christian burial. At the request of Governor Luis Muñoz Marin and San Juan Mayor Felisa Rinc?n de Gautier, the U.S. ambassador to Mexico, William O’Dwyer, arranged with Mexican government officials for the transfer by air carrier. Bithorn’s decomposing body, covered with mud and still in the clothes in which he was killed, arrived in Puerto Rico on January 12, 1952. The next day, about 5,000 people filed past his casket on the field at Sixto Escobar Stadium prior to burial in Buxeda Cemetery, Isla Verde, only a short distance from his birthplace in Santurce, Puerto Rico. As a symbol of respect for their former teammate and manager, the Senadores played the rest of the season wearing black patches on their sleeves. Ten years later, in 1962, the city of San Juan memorialized the island’s first major leaguer by naming its new 18,000-seat baseball park the Hiram Bithorn Stadium, a fitting tribute to the pioneer who opened the door for all the other Puerto Rican ballplayers who realized their dreams, and each in his own way contributed to the island’s legacy in major league baseball. A version of this biography is included in "Puerto Rico and Baseball: 60 Biographies" (SABR, 2017), edited by Bill Nowlin and Edwin Fernández. 3 Adrian Burgos, Jr. Playing America’s Game (Berkeley: University of California Press, 2007), 269-270. 4 Michael Bithorn interview by author, February 17, 2014. 6 Michael Bithorn interview by author, February 23, 2014. 12 Nick C. Wilson. Early Latino Ballplayers in the United States (Jefferson, North Carolina: McFarland & Company, Inc., 2005), 145. 18 Stephen M. Daniels, “The Hollywood Stars.” Baseball Research Journal #9, Society for American Baseball Research, 1980. 19 Interviews by author: Michael Bithorn, February 23, 2014, and David Hiram Arechiga, March 25, 2014. 20 The first was a pair of Cubans, pitcher Oscar Tuero and catcher Mike Gonzalez, St. Louis Cardinals, 1918, and the second was Cuban Adolfo “Dolf” Luque and Tampa-born Al Lopez, Brooklyn Robins, 1930. 21 Nick Diunte. Examiner.com. “Bithorn lead the way for Puerto Ricans in the majors.” Retrieved January 29, 2013. 27 David Maraniss. Clemente: The Passion and Grace of Baseball’s Last Hero (New York: Simon & Schuster Paperbacks, 2006), 28. 33 Fred Lieb. Baseball as I Have Known It (New York: Coward, McCann & Geoghegan, 1977), 260. 35 Gary Bedingfield, www.baseballinwartime.com. March 29, 2008. 39 Maraniss, 30. Family interviews, 2014. 41 Andrew Martin. “Hi Bithorn: Puerto Rico’s Baseball Pioneer.” The Baseball Historian. Retrieved January 29, 2014. 42 Jorge Colon Delgado. www.elnuevodia.com/blog-titulo-852202. December 29, 2010. 45 Obituary in The Arizona Republic, May 20-22, 2011.